Regional Council Bustan El-Marj is a ew Regional Council in the North District in parts of former Regional Council Lev-Ha'Galil. 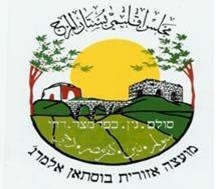 This Regional Council govern 4 settlements (all Arab villages with Local Committees). The city hall is in Nein. The regional council Bustan El-Marj (in Arabic = Garden of the Valley) was founded in 2001. It govern four Arab villages (Sulam, Kufur Masser, Nein and Dahei) . Pop. 8,000. Information in English at <www.bustanelmarg.muni.il>. The regional council got already an emblem (see: <www.shimi.co.il>) and as costumery in the area, the municipal flag will be white and charged with the emblem even thou photo of the city hall show only national flags. The Minster of the Interior notify his intention to give a protection decree to the emblem on 1 July 2007 (Published on YP 5695 p. 3629 on 23 July 2007) and his successor issued the decree 31 October 2007 (Published on YP 5770 p. 1694 on 27 January 2008) The emblem is the same as the unofficial one. The unofficial flag is emblem on white bedsheet.